Tom Banse covers national news, business, science, public policy, Olympic sports and human interest stories from across the Northwest. He reports from well known and out–of–the–way places in the region where important, amusing, touching, or outrageous events are unfolding. Tom's stories can be found online and heard on-air during "Morning Edition" and "All Things Considered" on NPR stations in Washington, Oregon, and Idaho. Before taking his current beat, Tom covered state government and the Washington Legislature for 12 years. He got his start in radio at WCAL–FM, a public station in southern Minnesota. Reared in Seattle, Tom graduated from Carleton College in Northfield, Minnesota with a degree in American Studies. When not sifting through press releases, listening to lobbyists, or driving lonely highways, Tom enjoys exploring the Olympic Peninsula backcountry and cooking dinner with his wife and friends. Tom's secret ambition is to take six months off work and travel to a faraway place beyond the reach of email. Wednesday will mark the 67th anniversary of the Japanese surrender to end World War Two. With each passing anniversary, there are fewer and fewer living witnesses to the event. Time is also running low for an aging U.S. Marine veteran who wants to return a captured Japanese war flag. Ex-U.S. Marine George Koller of Clarkston, Washington collects war memorabilia. 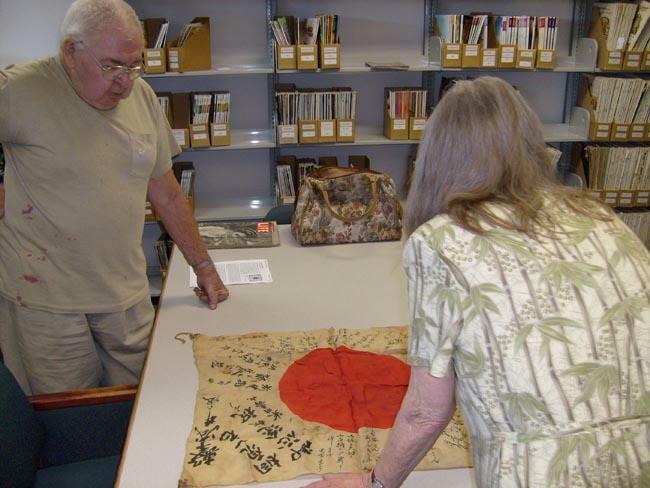 Among his possessions is an inscribed "good luck flag" carried into battle by a Japanese fighter pilot. The airman's plane crashed into the jungle of New Guinea late in World War II.